U.S. President Barack Obama speaks at the Lao National Cultural Hall in Vientiane, Laos, Sept. 6, 2016. The president addressed an estimated 1,000 people in Lao National Cultural Hall, one day after making history as the first sitting U.S. president to visit the country. Against a backdrop of flags representing the U.S., Laos and the Association of Southeast Asian Nations (ASEAN), Obama spoke to a group that included government officials, Lao and U.S. business leaders, students, civil society leaders and women’s groups. Obama’s has said engaging in the Asia-Pacific is critical to America’s future prosperity and security. The White House strategy has also aimed to serve as a counterweight to China’s rising influence and power in the region. With fewer than five months left in office, Obama said the U.S. is more deeply engaged in the Asia-Pacific than it has been in decades. However, the president also acknowledged the Trans-Pacific Partnership (TPP) - the economic “pillar” of his re-balance strategy – is in trouble at home. The massive trade deal, signed by 12 Pacific rim nations, must be ratified by the U.S. Congress. In this presidential election year, many Americans blame such trade pacts for lost jobs and both major party candidates, Democrat Hillary Clinton and Republican Donald Trump, have spoken out against it. Laotian President Bounnhang Vorachit and U.S. President Barack Obama talk with the help of a translator during an Official State Luncheon at the Presidential Palace in Vientiane, Laos, Sept. 6, 2016. Earlier Tuesday, Obama held talks with Laotian President Bounnhang Vorachit in the presidential palace. Following the meeting, the White House announced a three-year, $90 million contribution to Laos for a national survey of unexploded ordnance and efforts to clear the bombs dropped by U.S. forces in the 1960s and 1970s. About one-third of the 2.2 million bombs dropped on Laos remain undetonated and the lingering threat has slowed development in the country. "Given our history here, I believe the United States has a moral obligation to help Laos heal," said Obama. The White House said the two countries launched a new era in relations based on "a shared desire to heal the wounds of the past" and build a foundation for the future. It included partnership on issues including the economy, technology, education, security, the environment and human rights. Laos, which currently chairs the Association of Southeast Asian Nations (ASEAN), has been criticized for its human rights record. Obama and Vorachit noted in their meeting Tuesday "the benefits of a candid and open dialogue" to narrow differences on rights. The White House said the new ties continue the president’s policy of reaching out to countries with whom the U.S. has had major differences and complicated histories. It also reflects Obama’s efforts to more deeply engage nations in a region close to China, although the Obama administration has repeatedly said it welcomes a rising China that is peaceful, prosperous and responsible in global affairs. Thitinan Pongsudhirak, political scientist at Thailand’s Chualongkorn University, said while the U.S. seeks to boost its influence, Laos is “firmly in China’s orbit”. 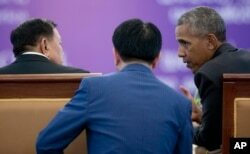 “The U.S. and China rivalry, competition for influence and interests in Southeast Asia, comprising maritime and mainland. The mainland is China’s backyard so it’s really China’s orbit within the mainland. But the mainland countries – Cambodia, Laos, Vietnam, Thailand – they are firmly in China’s orbit because China is the giant next door, especially for Laos,” he said. Thitinan said Laos was still seeking to maintain a degree of autonomy despite China’s influence, even though it is “susceptible to neighborhood influence and interference”. U.S. President Barack Obama, left, and South Korean President Park Geun-hye, right, look to the media at the conclusion of a bilateral meeting in Vientiane, Laos, Sept. 6, 2016. 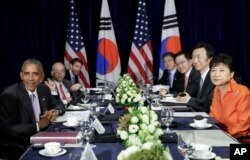 Also Tuesday, Obama met with South Korean President Park Geun-hye. The leaders discussed North Korea’s missile tests on Monday. Pyongyang fired three ballistic missiles from the western part of North Korea into the Sea of Japan. Park called the tests “fundamentally threatening” and said the leaders agreed to "respond resolutely" to any provocation and close “loop holes” in sanctions. Obama called the launches “provocative.” He also said the THAAD, the U.S. anti-missile system soon to be deployed to South Korea, is purely a defensive system. Later this week, Southeast Asian nations will meet in Vientiane for the ASEAN and East Asia summits to discuss a range of issues, including the North Korea nuclear threat, China’s aggressive actions in the South China Sea, counter-terrorism, trade and other issues. The visit marks President Obama’s eleventh and final trip to Asia as U.S. president.